Appearance: She’s maybe just slightly shorter than Rhoda Dendron, has very short, brown hair, and dark eyes. Typically wears a lab -type coat and plain clothes underneath (typically a light blue shirt and dark dress-like pants). Marital status: Single (she’s so busy with her career that she hardly bothers looking). None. She has probably taken a basic self-defense class, given the type of people she tends to deal with, but this probably won’t help against someone more trained than she is (which would probably be just about everyone else). She is normal, mortal, unarmed (unless the clipboard she’s carrying all the time counts as a weapon), and not particularly athletic. So, basically, your average St. Canard citizen. She is usually professionally distant and extremely competent in her job, but there are a few times when her sympathy for her patients may affect her judgement. Dr. Youngbeak is a workaholic and tends to come across as polite but aloof outside of work but sympathetic, understanding, and professional towards her patients. She is mostly well-adjusted excepting her unhealthy level of workaholism an d tendencies towards insomnia (due to her staying up reading and researching for work) and a possible caffeine addiction. Because of her job, she is naturally an Extroverted person and yet appears to have very few friends (probably again, because of her job). When she’s not engaging in work-related activities (which is almost never), she enjoys reading a few types of fiction (mysteries, drama, and sci-fi) and watching movies/TV (pretty much the same with the occasional Derek Blunt movie thrown in) and just going out somewhere and having a good time with friends. 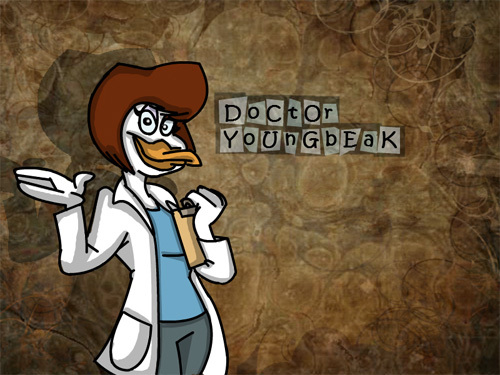 At a young age, Dr. Youngbeak’s parents divorced for reasons that were unclear to her until about the age of sixteen when her father was arrested because of his associations with the Mafia. Both of her parents had treated her very well, so it came to a big shock to her that her father was so deeply involved in criminal activity. This was probably the catalyst that inspired her to work in some field that would help her understand criminals better, but given that she was fairly young at that age, she flip-flopped back and forth from FBI agent to police officer to criminal psychologist to parole officer to criminal defense attorney, etc. She still visits her father in prison once every year as regular as clockwork and harbors no ill will against him. Eventually upon graduating high school top of her class at 17, she enrolled at St. Canard University where she eventually decided to major in psychology. She finished her degree and graduate school in near record time (which was probably also about the time she developed insomnia and a caffeine addiction). She now has her own little private practice. (For RP purposes. In Duckham Asylum, her background is a bit different in that she worked for courts and for prisons and such before finally becoming a head doctor at Duckham Asylum).